Click here to learn about our Romance Baskets...the perfect addition to your stay in our suites! 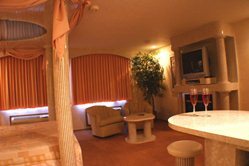 Also, with each stay in one of our exciting Fantasy Suites you'll receive coupons for the monthly special from Rube's Steakhouse in Montour and 10% off Winding Stream Spa at Meskwaki Bingo and Casino! * Fantasy Suite reservations are charged at the time of booking. Roman Retreat...Will you answer the call of Rome? Relax in this elegant and sophisticated room that emphasizes the grandeur of Rome. 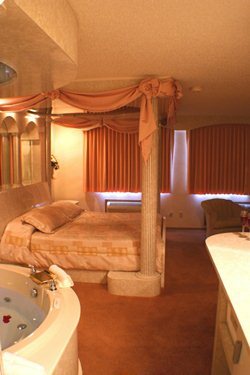 The designer’s hand crafted Roman pillars surround the king sized bed and oversized whirlpool. 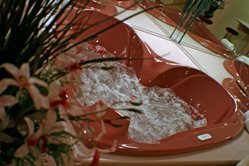 Ease your tension and pamper yourself in this whirlpool outlined with beveled mirrors. This grand whirlpool also provides dazzling mood lights fit for any ruler and provides a clear view of your electronic fireplace. The starlit mirrors above the bed and whirlpool add to the ambience. Spoil yourself and spend some time in the soothing shower featuring four body sprays and dual shower heads. Spend a night discovering this majestic side of Rome. ...when people dwelled in caves...Wait a minute, there is nothing simple about our Crystal Cave. Once you cross your threshold let the lantern light guide you around your dwelling. 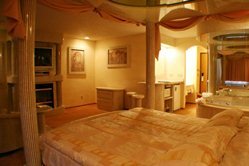 The main chamber features your large round bed with it sumptuous memory foam mattress. From your bed choose to feast your eyes on your relaxing electronic fireplace, your 42 inch Sony Vega television, or the highlighted crystal display above the fireplace. Head over to your oversized whirlpool with water jets, air jets, and submerged mood lights, and on the way stop and relax on your comfortable specially designed couch in the sitting area. 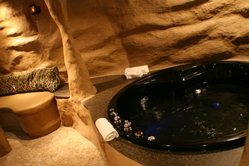 As you soak away your worries and cares in the whirlpool, let your eyes lift upward and enjoy your personal starlit sky from the privacy of your own cave. 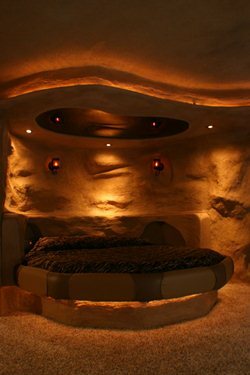 Once you are ready take a stroll into the private sauna (yes there really is a sauna in this cave) and find out just how relaxing a night in a cave can be! To top it all off when you are ready step into your deluxe shower and rinse off under your waterfall shower, while six different body sprays further enhance your experience. Come spend a night in our Crystal Cave and have a unique and memorable experience! Tilt the odds in your favor by staying in this suite of good fortune. Enjoy the 44-inch TV while relaxing in your king sized bed with overhead spade-shaped starlit valance. Bask in your windfall as you relax in the oversized whirlpool with submerged mood lights and look around the casino inspired décor. You’re always a winner when you bet your night’s rest on this no risk suite! 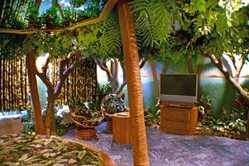 Rainforest - Take a journey to a lush, tropical oasis. Let the sounds of the cascading waterfall lead you to your whirlpool bath. Enjoy this oversized mist blanketed tub, surrounded by mirrors, rocks, and plenty of foliage. Then as the ruler of this jungle, feel free to put your head back and enjoy your own personal starlit sky. The featured round bed is lit by tiki torches and also offers its own view of the starlit sky. Experience tranquility in this fantastic tropical paradise! Heart's Delight. 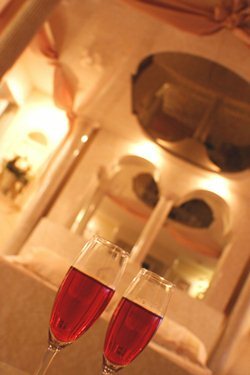 Spend a night surrounded by love and romance. Starting with the heart shaped table, and rose colors throughout, this room inspires romance. Indulge yourself in the oversized heart shaped whirlpool, complete with underwater mood lighting. Enjoy a restful night in the king sized bed, and relax peacefully as you look up into your overhead starlit heart-shaped mirror. Step into the luxurious shower and refresh yourself with dual shower heads and body sprays. Life is made up of moments and this is your opportunity to share one with your special someone! Northern Nights - our newest suite! Stop and visit the newest residence at Designer Inn and Suites and stay at 106 Penguin’s Place. Once you get inside you will realize that while most Igloos are built to keep the elements out, this one is designed to keep you inside. Get cozy in the oversized two-person whirlpool tub complete with water jets, air jets, and underwater mood lights. You will sleep well on the memory foam mattress, in the custom designed round bed with an icicle headboard, or sit on the custom designed couch in front of the electronic fireplace and watch the 42 inch television. Another great spot to enjoy some well-deserved relaxation is in the spacious private sauna located in the snow fort built right into the room. Be sure to take time out to treat yourself in the deluxe shower featuring two shower heads, four body sprays and a unique overhead water spray. Whether you are beating the heat, or finding a cozy spot to stay warm at, Northern Nights makes the perfect wintry retreat for two, any time of the year! Greetings Princes and Princesses from all far away places! Take a magic carpet ride to our exotic Arabian Nights suite. Sleep under the stars in your plush round bed inside your very own magnificent sheik's tent. 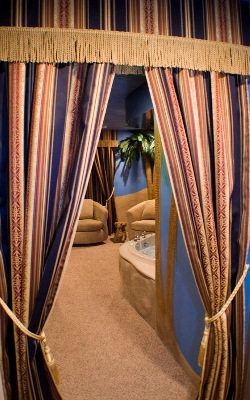 Unwind in your grand whirlpool that includes water jets, air jets and submerged mood lighting or relax and take a ride in the magic carpet lounge. Your regal walk-in electronic shower includes a rain dancer spout. Come stay a night in this romantic desert oasis!